Wage growth increased at a slower-than-expected rate but remained in double digit territory. The reduced growth rate is related to public sector bonuses. Hungarian average gross and net salaries grew 10.1% YoY in August, below consensus expectations. The 2.7ppt drop in wage growth compared to the previous month means that the latest reading shows the worst growth since January 2017. However, as this is still adouble digit growth and is mainly the result of one-off effects, we see little reason to worry. The worse-than-expected wage growth data can be traced back to the “only” 6.1% YoY salary growth in the public sector. However, as this reading is due to the 73.4% YoY drop in premiums and one month bonuses, the underlying trends still look favourable. 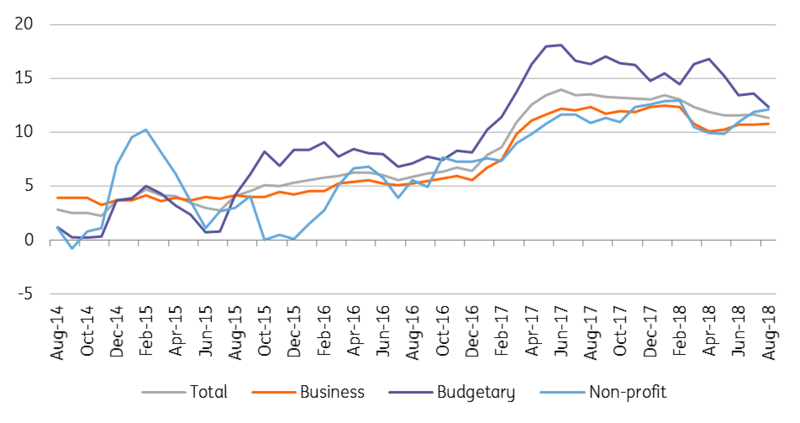 Regarding the business sector, the 11.4% YoY growth exceeds the average for 2018, with the labour shortage still pushing companies to pay more. According to the World Economic Forum's latest Global Competitiveness Report, the (lack of) “ease of finding skilled employees” indicates that companies still have a hard time finding the proper labour force. Hungary ranked 138th out of 140 countries in this part of the survey. On labour demand, the overall picture remains rosy. 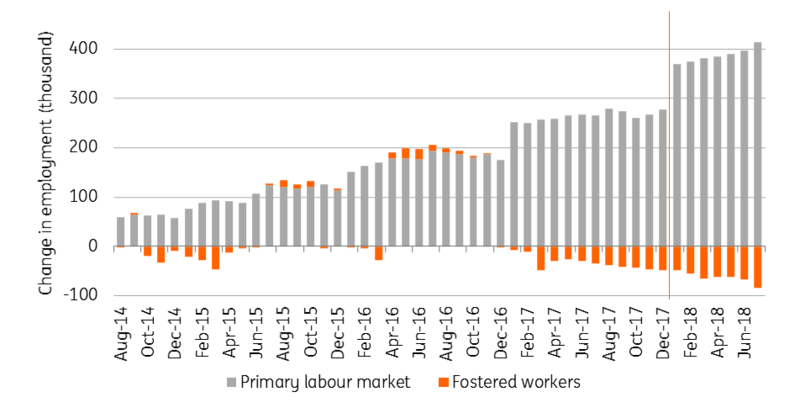 The number employed in the primary labour market increased by 127.8k, while the number of fostered workers fell 46k to 114.5k. Demand for labour will keep pushing wages up, although accelerating inflation means real wage growth won’t reach double-digit territory in 2018 as a whole. Nevertheless, 9% YoY real wage growth would still be above the historical average.